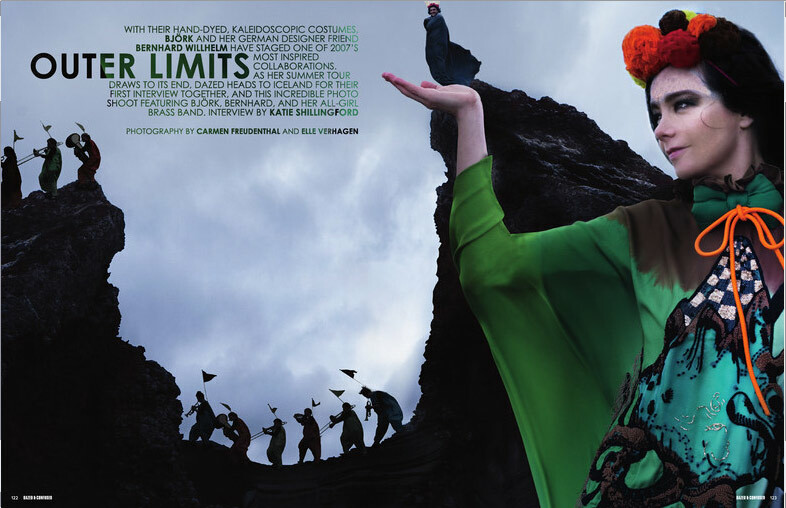 Dazed travels to the furthest reaches of Earth to talk all-girl brass bands and kaleidoscopic explosions of colour with the two agent provocateurs behind one of 2007’s most far-out collaborations. 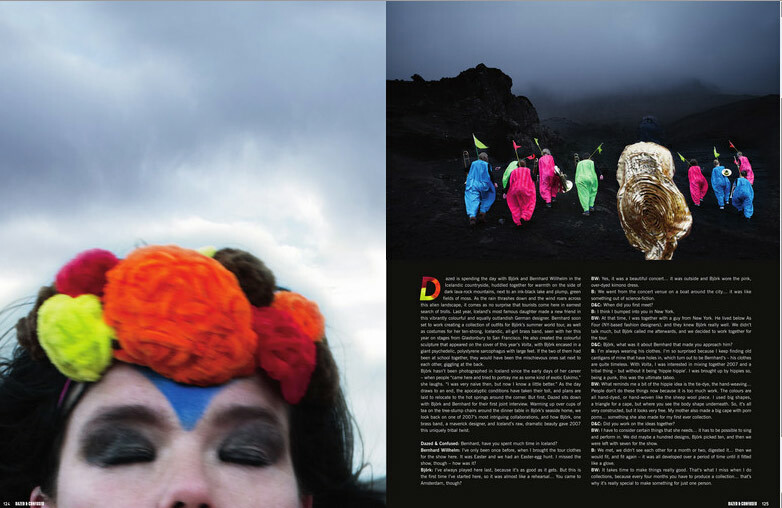 Sparks flew when Bjork met outlandish German designer Bernhard Willhelm and the two have been busy collaborating since Bernhard created a series of looks for Bjork and her all-girl brass band that have been touring with her this summer. 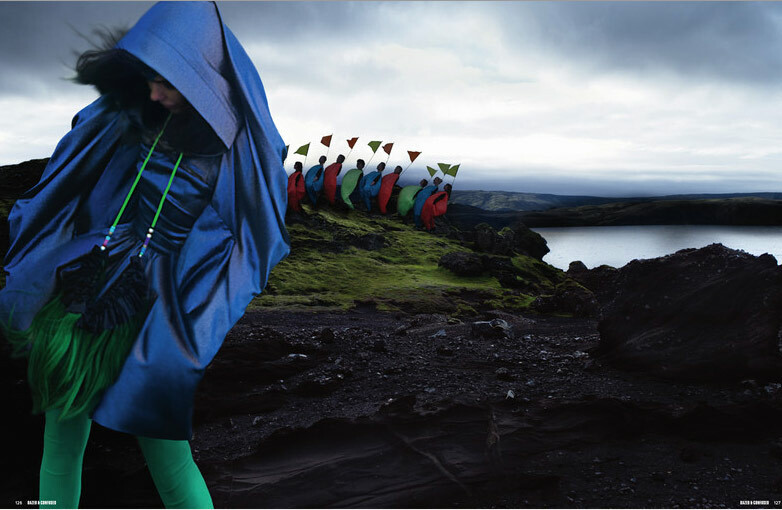 He also created the garish sculpture that is on the cover of her 2007 album, Volta. BW : What are more fun to play : festivals or your own concerts ? B : I like a mix : Recently we did many festivals in a row and then it was our first solo show for a long time and we were like, “Yes ! It’s our atmosphere.” But then it’s also nice to see other bands and meet other people. Glastonbury was fun, but then we played in Belgium in between Marilyn Manson and Muse ! That was late at night and it was full of lager louts. It’s funny but at the same time it isn’t. BW : It was funny to see the audience, because I think the girls react in a different way to your music from the boys ; they are very happy and dancing whilst the boys are all standing still. B : But when you where in Amsterdam, I could pick more calm songs, which was the first time in a long time. Being put between crazy bands and playing at midnight, then you have to skip all the quiet songs and just... [pretends to rave]. There is no space for ballads then ! B : Yeah, they just made it and there’s only two in the world. It’s hard to explain what it is, it’s sort of like a table made of plastic with a computer projector at the bottom, and a series of cubes that you move around. A few of them are a beat, a few of them are a base line, a few of them are echoes, and they all work as catalysts. It’s kind of like a Ouija board. I think it’s good because with computers, you go into this page and then you click on this, and then you go to this and it’s like a brain thing. But what’s great about this is that it becomes a physical thing, because when you are playing live you don’t want to sit there and programme, you just go like this [moves cups of tea around table as if it’s a chess piece] and you make a decision. Anybody can do this, you don’t have to be a brain surgeon to do it. D&C : Tell us a bit about the brass band and how that came about. B : When I was making the album I was getting people together for the tour and I suddenly realised, “Oh my god I am going to be with only boys for one and a half years !” That’s not so bad, but I like a balance. BW : So, were the band a group that was already together ? D&C : Oh no, the poor three left ! D&C : The brass band are all Icelandic girls, and here we see them with you in the Icelandic landscape... coming back to Iceland seems to be a theme. B : I haven’t shot anything here for a long time. When journalists came here and tried to portray me as some kind of exotic Eskimo or something, I was very naive and I think now I know a little better. I wanted to change that “elf from the middle ages” idea of Icelanders, none of my friends are like that. What I’ve done with Bernhard feels like a closer representation of what it is to be an Icelander now, rather than this woollen sweater image, which is nonsense. BW : I think most people must think Icelanders look like Eskimos and maybe look a bit like Bjork, but in fact they’re completely different. But people always need clichés. 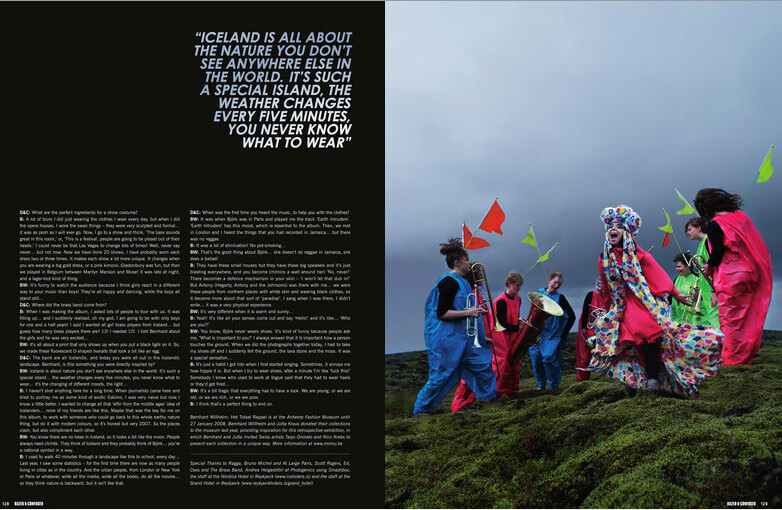 They think of Iceland and they probably automatically think of Bjork, you’re national symbol in a way. B : Last year I saw some statistics : it was the first year where there were 50:50 people on earth that are rural and urban. Before that there were more people rural than urban. It’s just that the urban people, from London or New York or Paris or whatever, they make all the media, they write all the books, they do all the movies, so they think that living in nature is really backward, but it isn’t like that. People who have English as a second language, like all the people of Asia, Africa, South America, Iceland, that’s what is normal for them. They have nature and mobile phones at the same time. For me it’s not so far out. I don’t like it when people portray Iceland as out there, I prefer it when it’s reality. 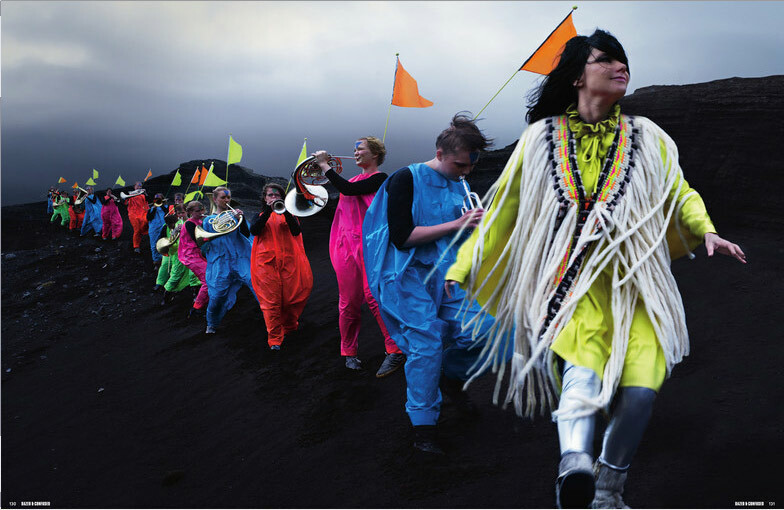 Earlier this year, Bjork invited fans to make a video for the single Innocence, taken from the album Volta. The response was impressive with almost 500 entries, and the standard so high that a shortlist of the 10 best videos was created. The overall winner, shown here, was made by French animators Fred & Annabelle, whose entry took an image from the cover artwork from Volta, and incorporated it with generated footage to create a dark world where the CGI-Bjork is covered in dancing facial tattoos and appearing amidst crowds of clones.